"Pelicans" by Lauren Fedorko, the cover photo for Kelsey Review's summer edition. West Windsor, N.J. – Kelsey Review, Mercer County Community College’s (MCCC’s) literary journal that went to a fully online quarterly format last fall, has just posted its Summer 2017 issue. The latest issue features art, poetry, and prose from contributors who live or work in Mercer County and is the final issue of the academic year. Says Kelsey Review Editor Jacky Vogtman, a member of MCCC’s English faculty, “While editing the pieces in this issue, I was astounded by the wide-ranging styles and incredible talents of the writers and artists in the Mercer County community…So read these pieces, be inspired, and then apply that inspiration to your own life." 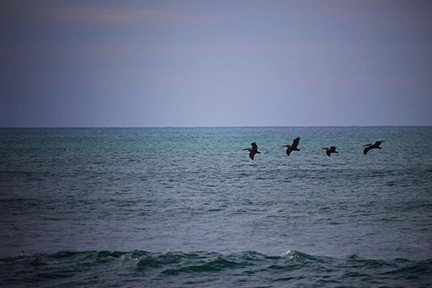 Submissions to the summer edition include a cover photo entitled “Pelicans” by Lauren Fedorko; fiction by Emma Ljung, Jeanine DeNitto, Leonora Rita V. Obed, and Ilene Dube; poetry by Nancy Scott, Lauren Fedorko, Steve Smith and Lavinia Kumar; and nonfiction by D.E. Steward. According to Vogtman, many of the writers are veteran contributors, with a few new names in the mix. She says the themes are a mix as well: Ljung’s “Medium Smile,” a story of temptation and longing; Denitto’s slice-of-life about childhood, identity, and culture; and Dube’s piece, the “Summer of Sam,” which is about so much more than that one murderous man. The poetry is also a mosaic, ranging in style from Smith's striking metaphors, to the tautly crafted, imagistic pieces from long-time contributors Scott and Kumar, to more expansive pieces by Fedorko. The current as well as past issues of Kelsey Review are available online here. In addition to Vogtman, the editorial board includes Ellen Jacko, Roberta Clipper and Luray Gross. The first edition of the 2017-18 Kelsey Review will be published in September. For more information, email Kelsey.Review@mccc.edu or visit www.mccc.edu/kelseyreview. Kelsey Review welcomes new friends on its Facebook page.The editors invite the community to “like” the page and add their comments about the material in the journal and the arts in general. Funding for Kelsey Review is made possible in part by the Mercer County Cultural and Heritage Commission through funding from the Mercer County Board of Chosen Freeholders, and the New Jersey State Council for the Arts/Department of State, a partner agency of the National Endowment of the Arts.